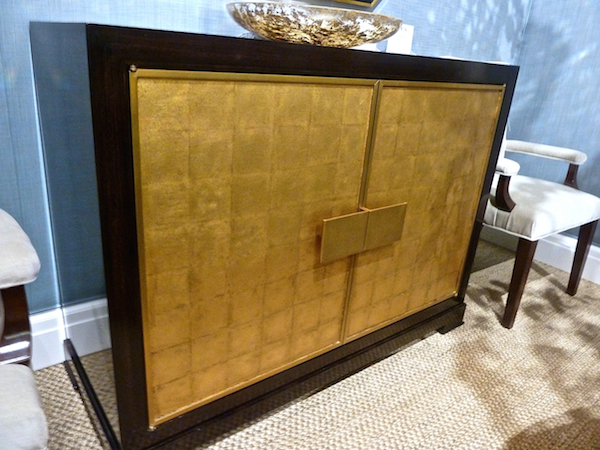 Whether brass, gilt or gold leaf, tones of gold at High Point added a luxe touch to many showrooms. 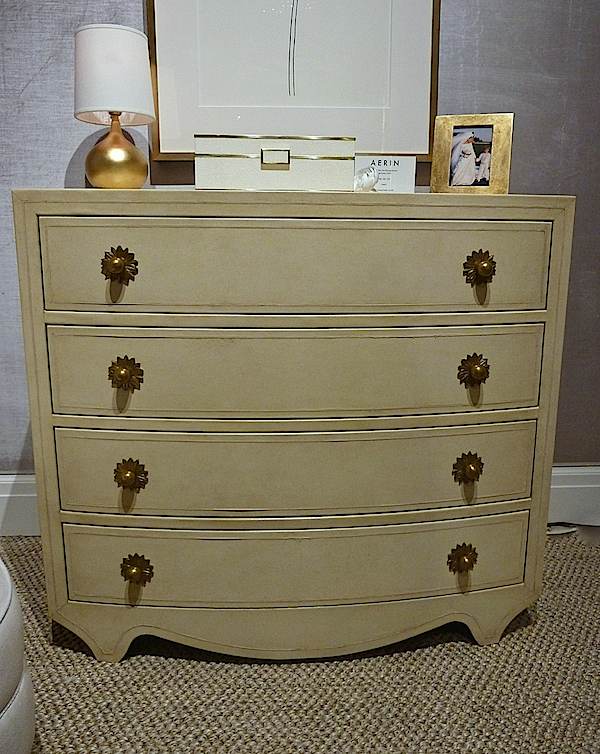 Charlotte Moss‘ new collection at Century included timeless decorative pieces such as the Beaufort chair and ottoman in a charming faux bamboo that would add instant chic to any room. 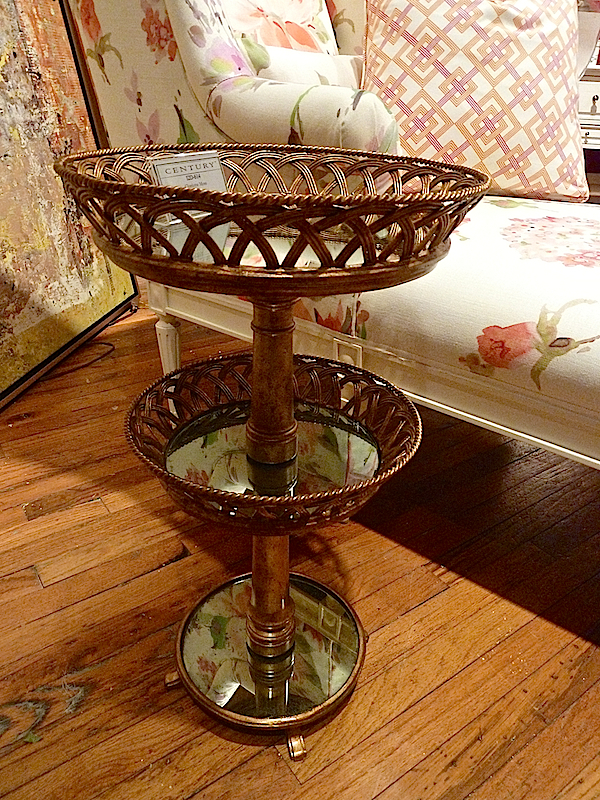 And I loved her tiered mirrored Memphis side table, a stylish and versatile piece with plenty of room for seatside accoutrements such as drink, snack cell or remote! 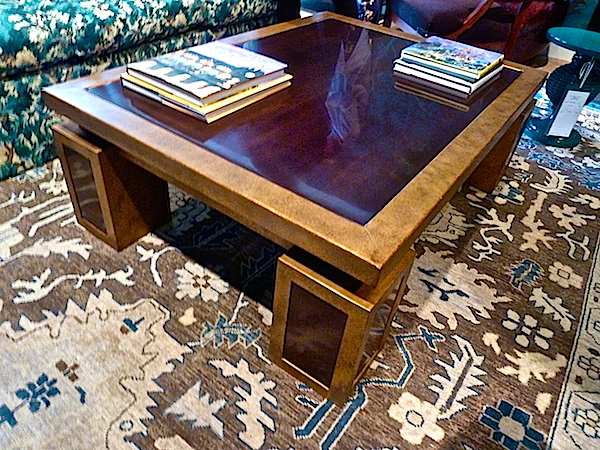 Alexa Hampton introduced her Laird coffee table at market. 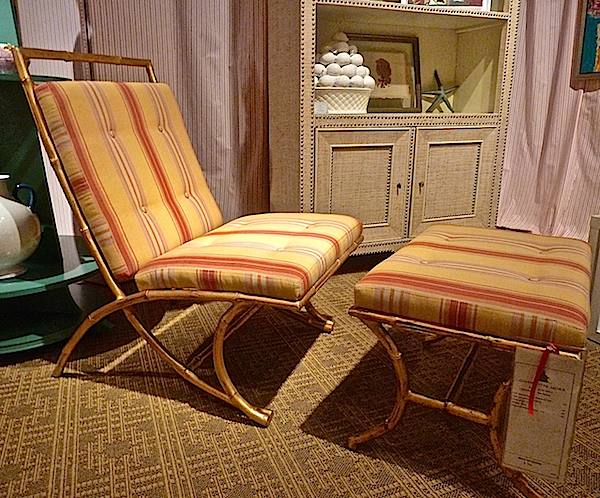 With brass trim and heft, it offered solid balance in spaces of intense color and pattern like her rooms at Hickory Chair, but would be equally effective with neutrals. 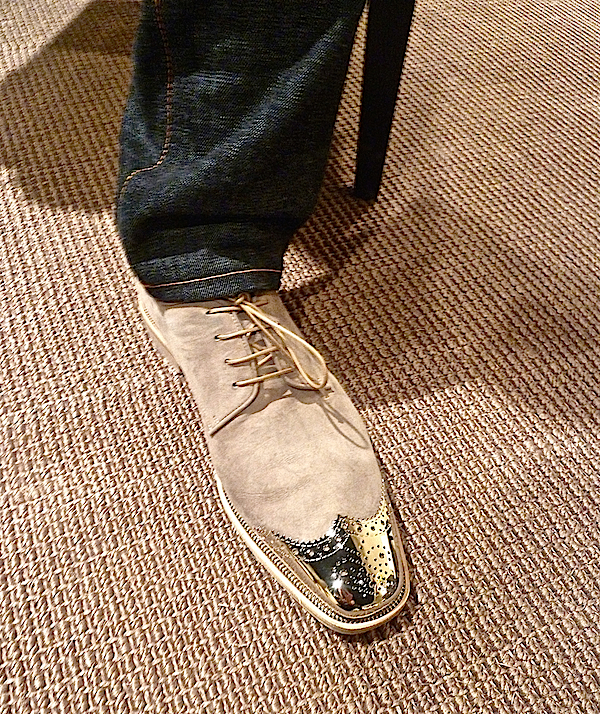 At Chaddock, Larry Laslo had the Midas touch, added glamorous glints of gold in many of his rooms – and even on his shoes! 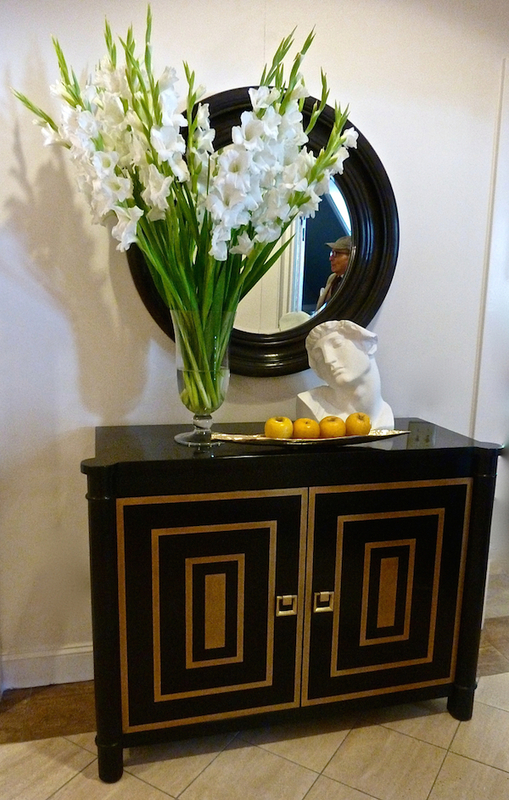 Classical reference within a contemporary vocabulary were clear in this vignette with his Parallel lines chest, accented with gold. 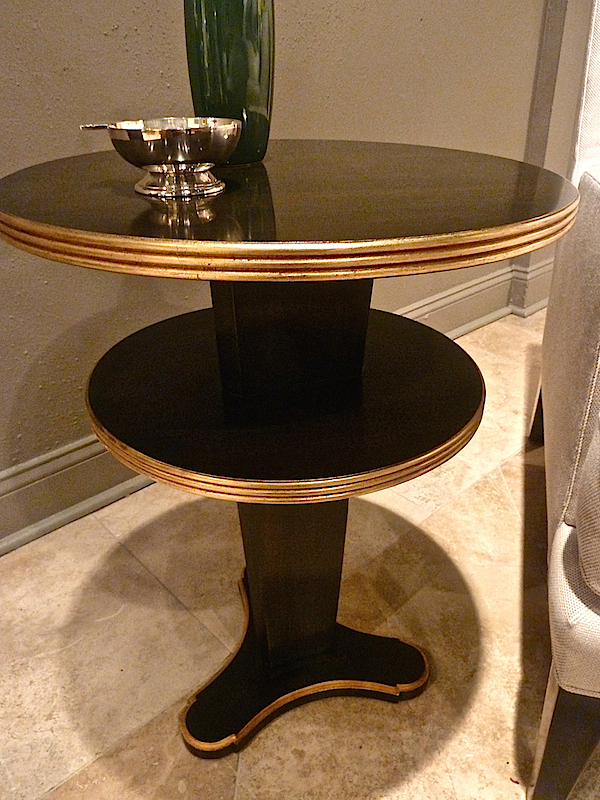 Elegant lines and finish on his Roly Poly table, belie its whimsical title. And his charming Topsy table has a Jeeves-like anthropomorphic quality, waiting to serve. 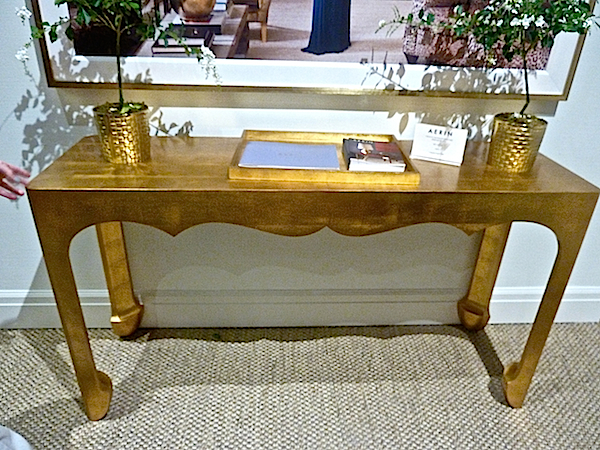 and a unique textured detail on the brass legs of his Thicket console, lending the piece an artisanal quality. 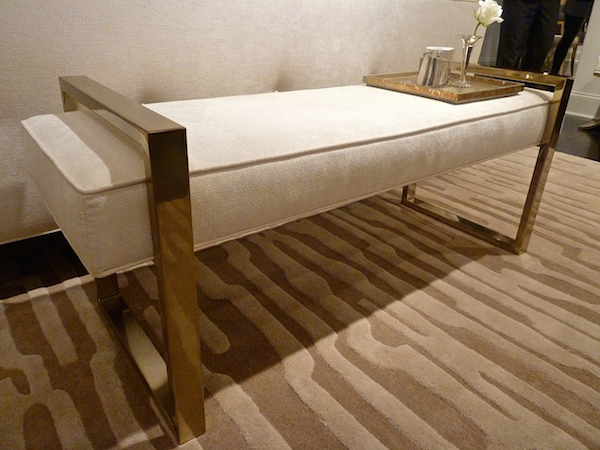 Bernhardt went all out glam this market with a shiny Tom Ford-esque salute to the 70s and Jet Set style. 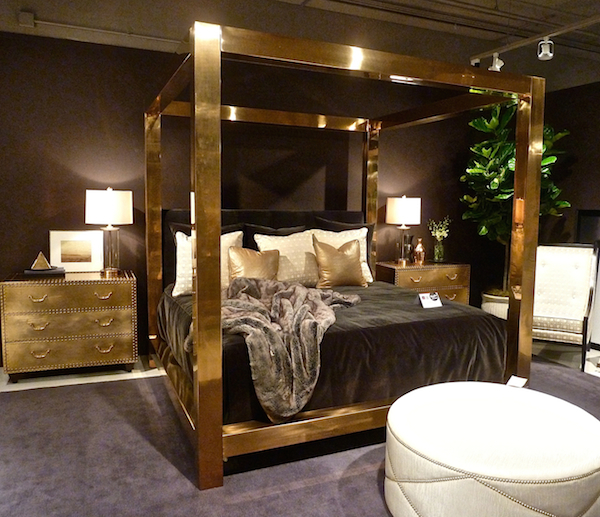 The Kensington brass bed was a favorite among many at market. 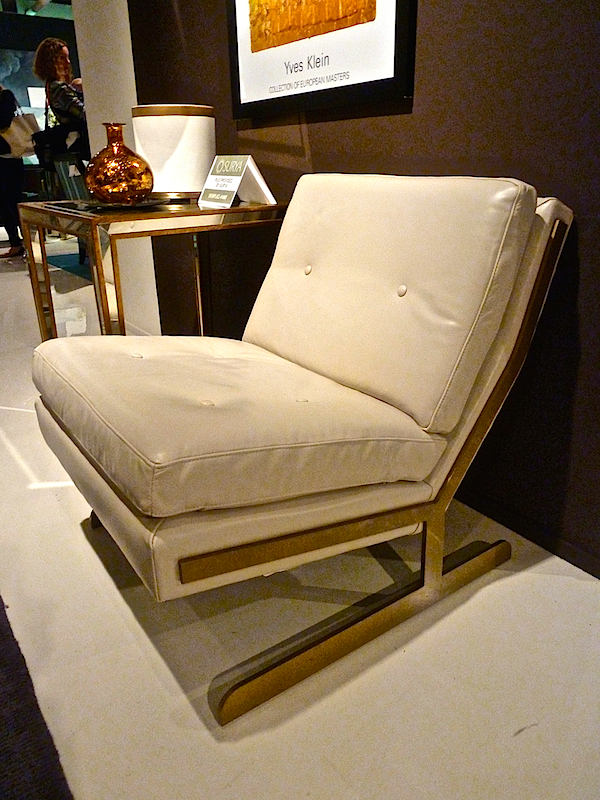 And I loved the retro chic and incredible comfort of the leather and brass Lance chair. and versatile Jet Set bench. 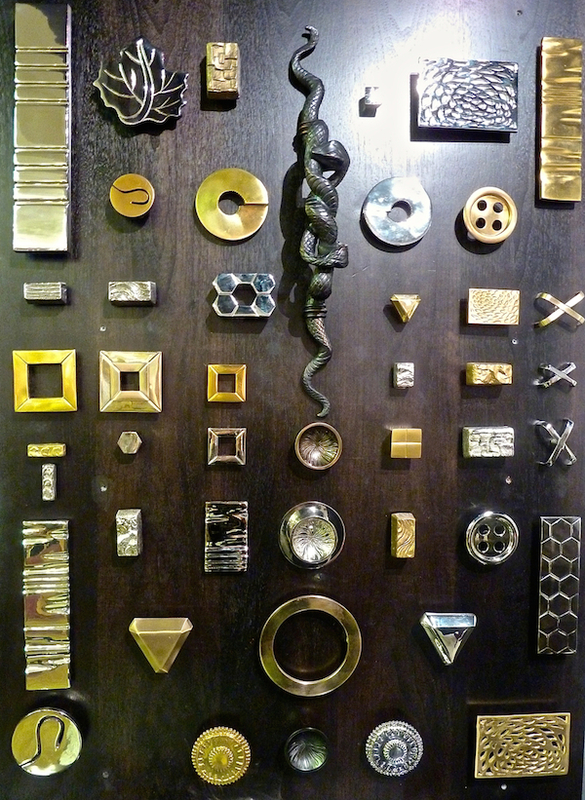 and Lisa Jarvis‘ brass hardware offers unique character building finishing touches to doors and furniture. 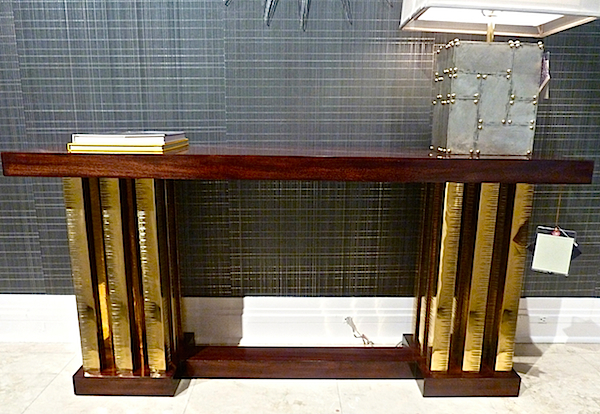 and the Fremont server with hand painted gold linen is a luxe modern piece with a subtle nod to global glamour. 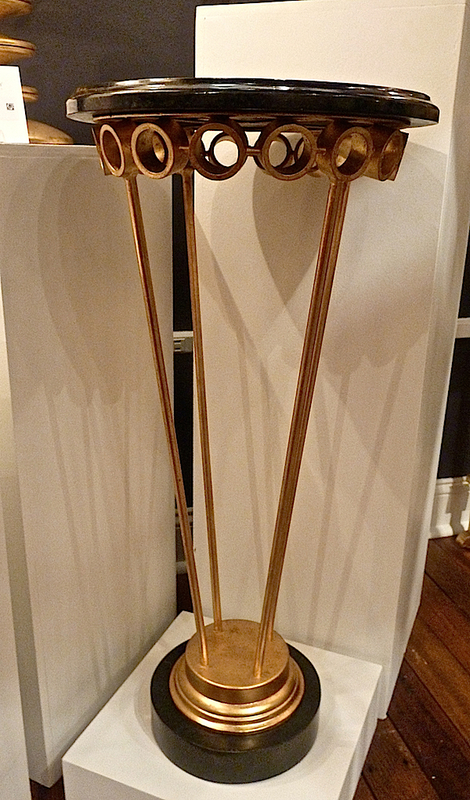 but it was really the retro chic brass hardware that stole the show. 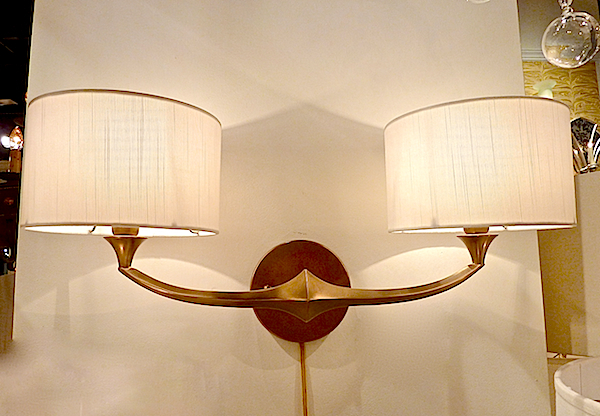 AERIN’s lighting collection for Visual Comfort was a home run. 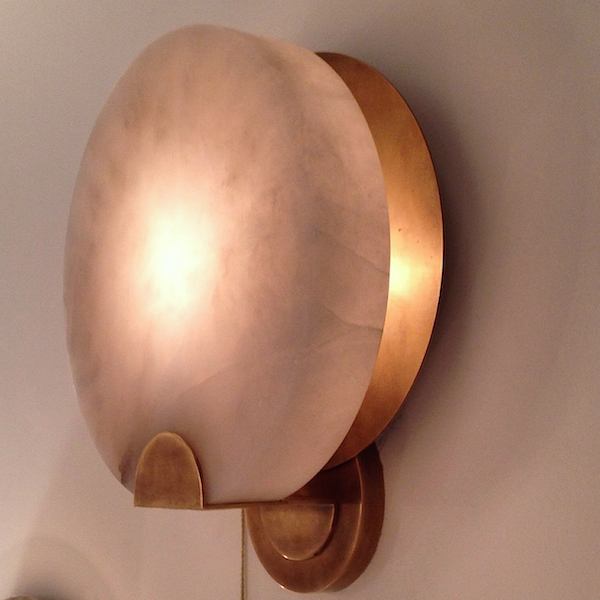 Those of you who follow along on Instagram know that her alabaster and brass Iveala sconce was a favorite. 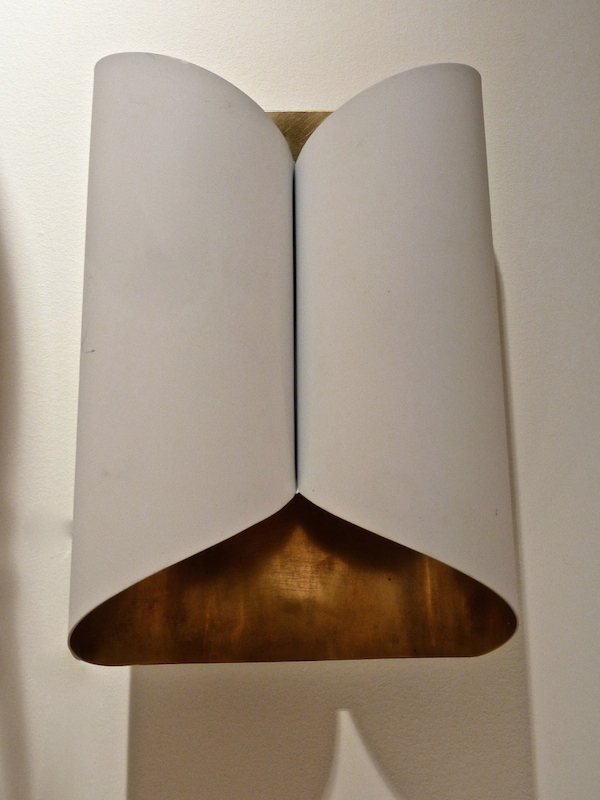 and Selfoss sconces had a sophisticated European mid century feel. and the Dunmore, available in a variety of finishes, with or without the glass, offer lovely alternatives. 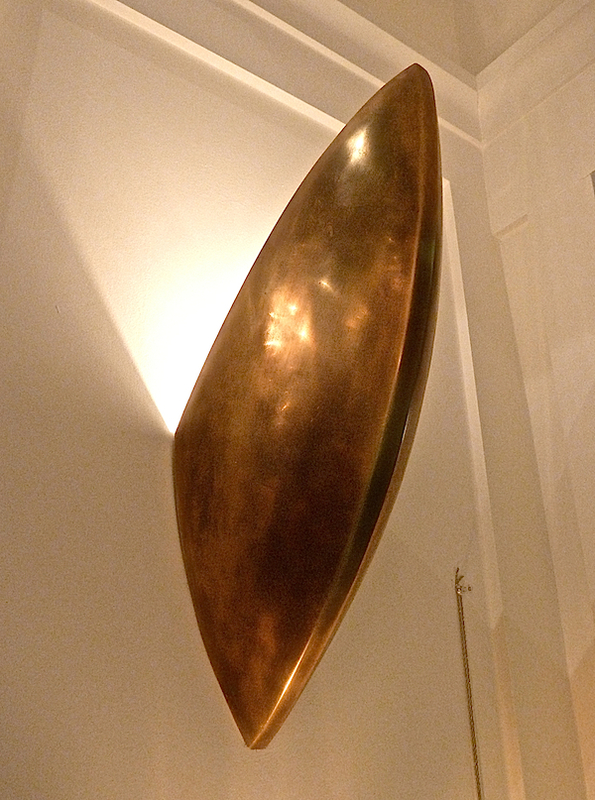 and offered as a sconce as well. 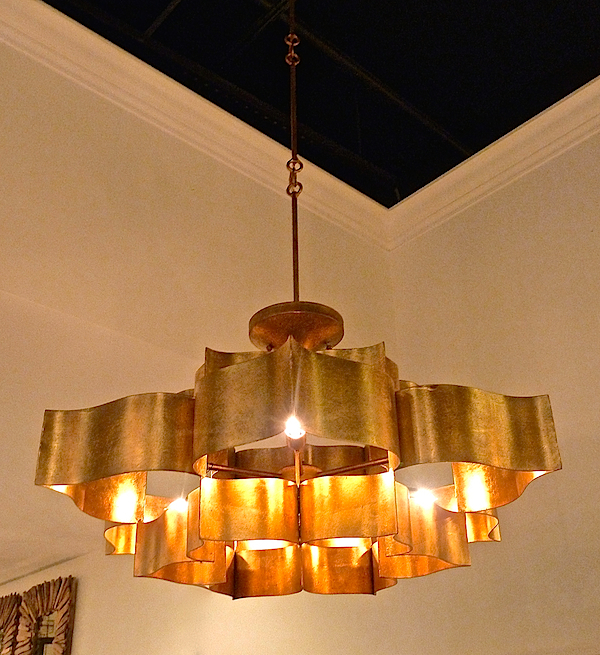 The Grand Lotus chandelier included a little exotic appeal with its glamour. 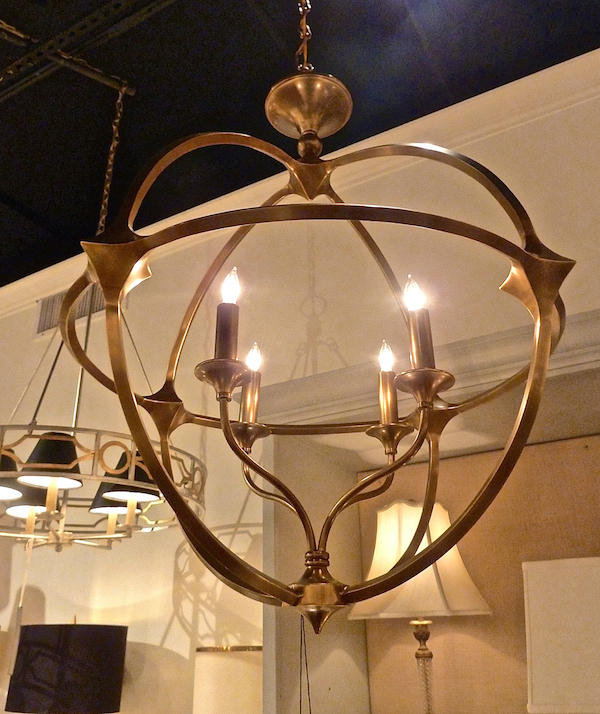 and the Shelley Chandelier in washed gold leaf is a fabulous style statement, combining of mid century and modern forms. Occasional tables were a strong category. 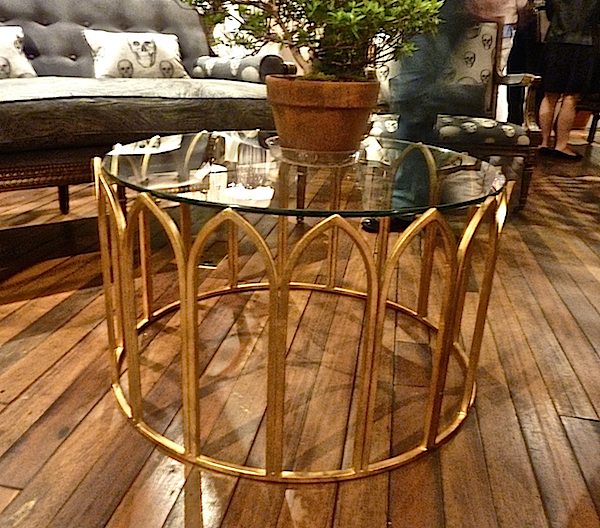 The airy Cathedral table is a versatile piece with more than just ecclesiastical appeal. 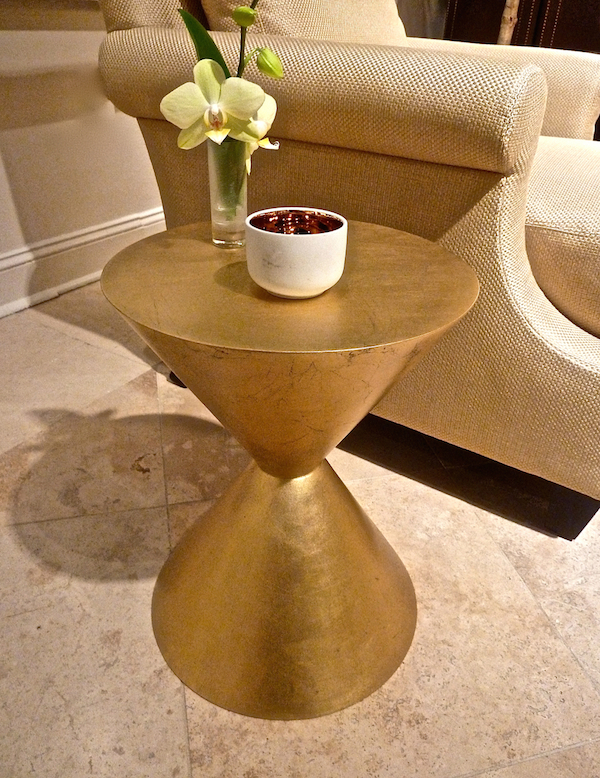 And the Dandy drinks table with contemporary gold leaf, is perfect for those space challenged quarters. 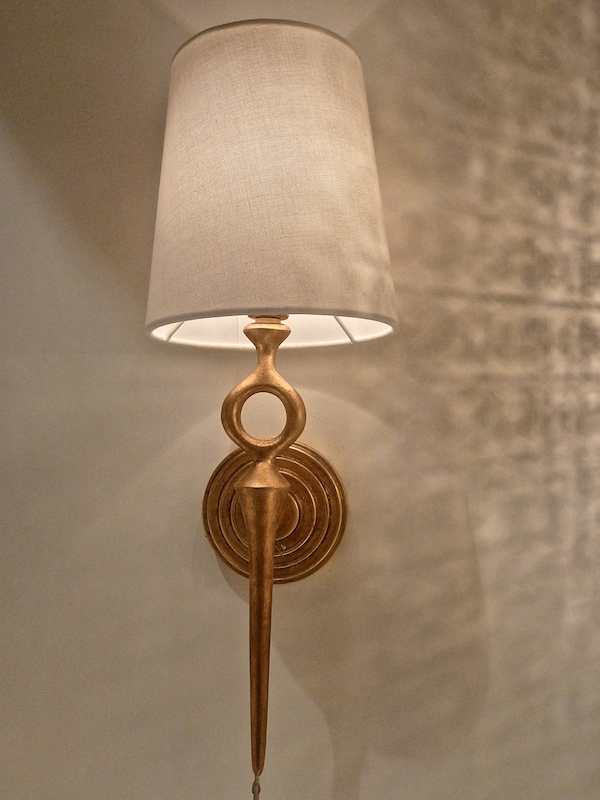 Arteriors can always be counted on for creative decorative solutions. 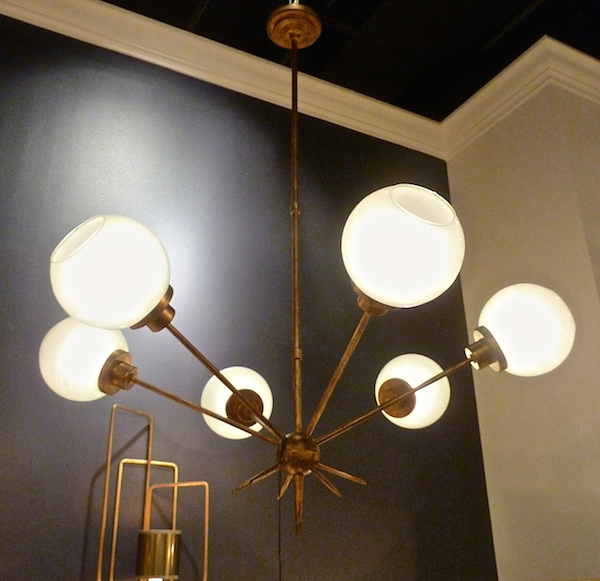 Their Keegan chandelier is a sputnik style light with the addition of bobeche like parts, lending the piece a little feminine flair. 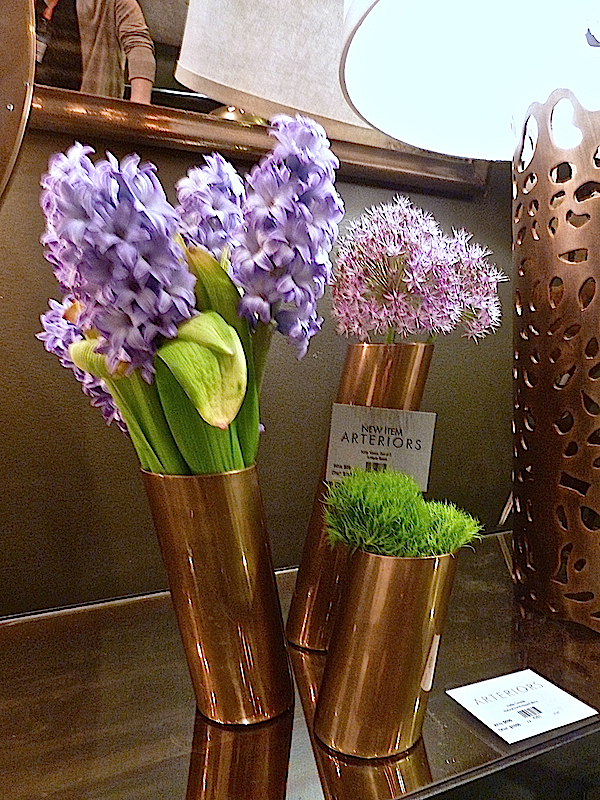 These brass Kirby vases are on my wish list. Used grouped or individually, their quirky akimbo quality is a chic and unique. Laura Kirar’s new Mexican inspired offerings are artisanal with great texture and artistic appeal. 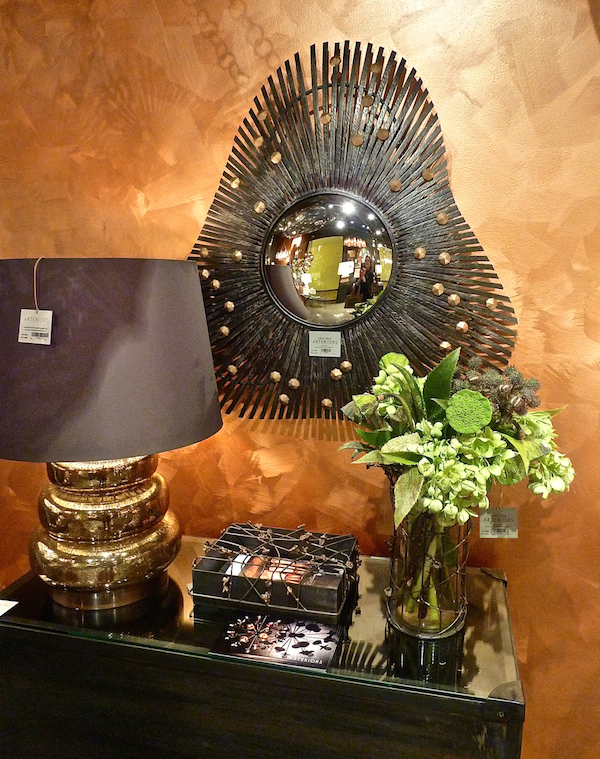 I loved the unusual Falcon mirror with its amoeba like shape and the brass bees on the rustic chic Mariposa box were an inventive touch. 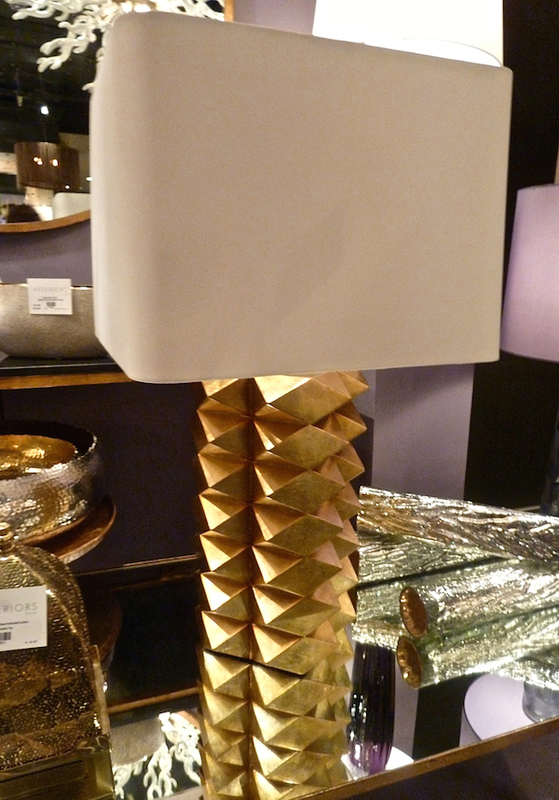 And I think this gold Jackson lamp offers a plethora of placement opportunities. Graphic, sculptural and modern it is a great form meets function choice. Be sure to stop back on Monday when Susanna Salk and I will be debuting a stylish and entertaining new video feature you won’t want to miss! This entry posted in interior design. 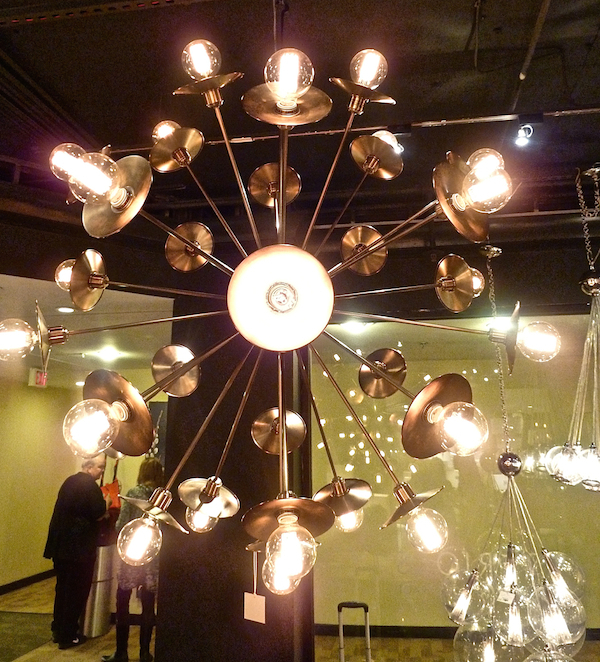 Entry Tags: design trends, High Point Market, interior design Bookmark the permalink. Great market coverage! I was there, how did I miss so much of this??! Yes, great coverage – I wasn’t there but feel like I was. 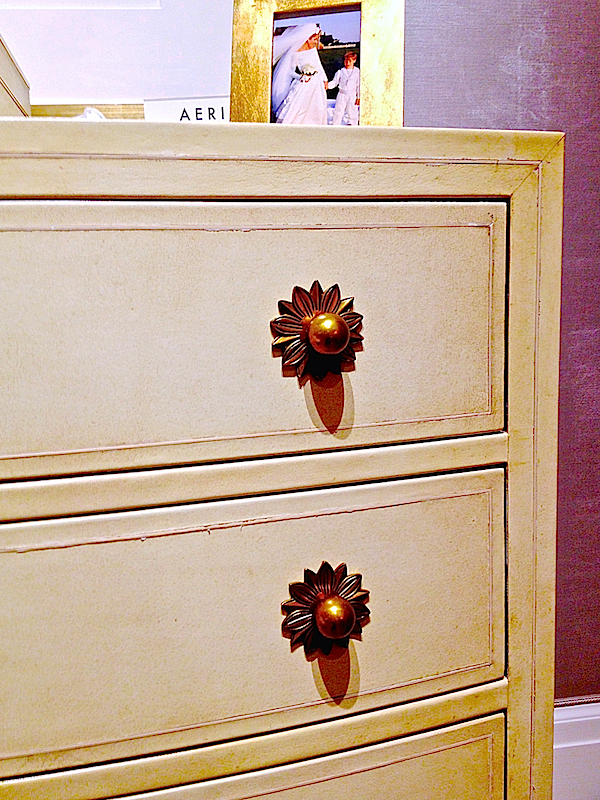 I love it all Stacey, the Lisa Jarvis hardware collection is intriguing and Aerin’s Iveala sconce, fabulous! 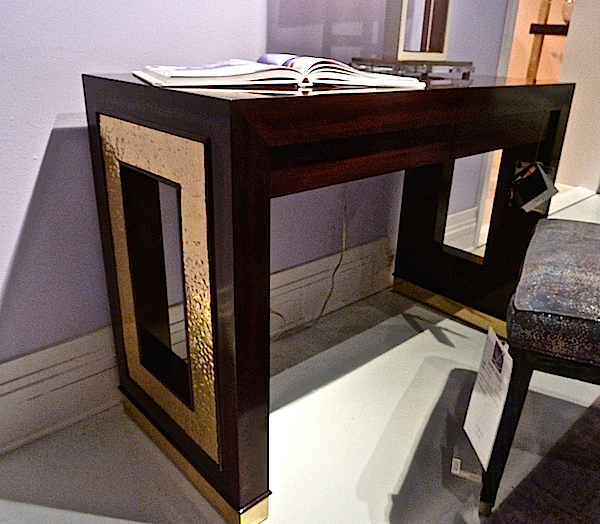 I love these pieces–inspired by Deco, Moderne and the 70’s, but totally standing on their own merits. Loving the the gold and brass. Wonderful roundup, Stacey. I love the way gold brightens a room and ads a little richness. Is there anything Aerin Lauder can’t make beautiful. Her collection with El Victor is just lovely. Wish that first console would fit in my entryway! 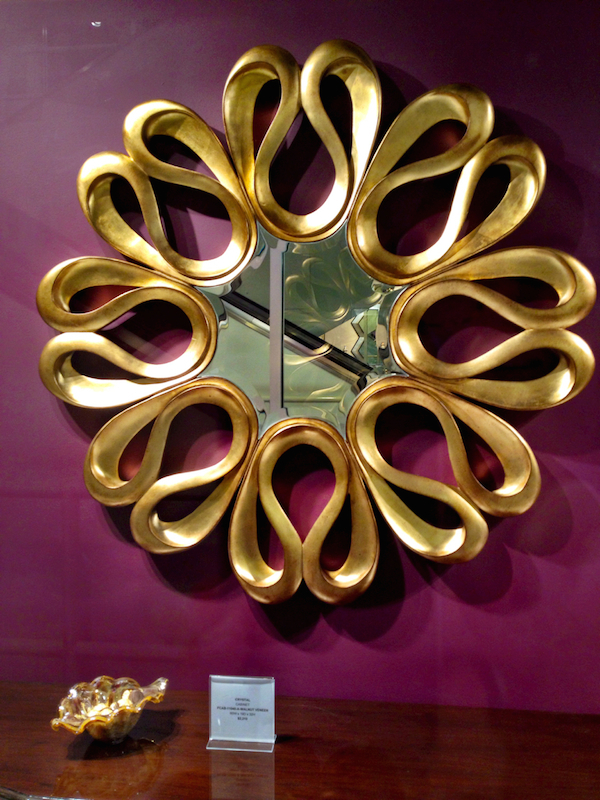 Stunning gold additions for any space! Love the parchment piece as well as so many others! WONDERFUL choices! 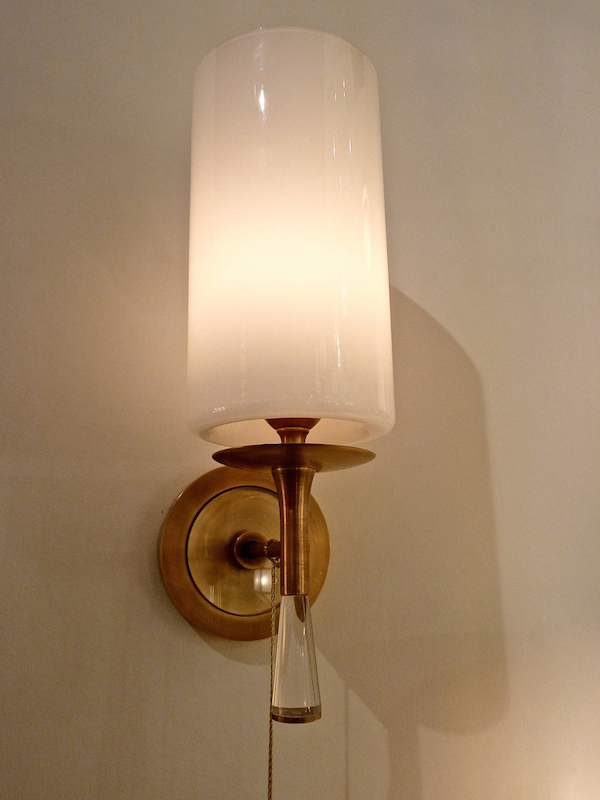 I love the light fixtures by Aerin for Visual Comfort and have specified them today for a project in San Francisco. Thank you for your sensational coverage of High Point! Oh my! This is fantastic, as usual. I can’t wait for the video. I love your videos Susanna! Love the Ilinea Bliss mirror. 79 queries in 0.546 seconds.